June 5, 2014 by Ecommerce News. About Marketing with tags France, Germany, Italy, Poland, Spain, The United Kingdom. 5306 views. Facebook is a very popular social network amongst European online retailers. Except for the United Kingdom, where online retailers are more active on Twitter. But Twitter is however still less popular in the UK than in other countries like Germany or Spain. These two countries have the most social media savvy online retailers, as 90% of them are on Facebook and 80% are on Twitter. This is the result of a study carried out by German company Idealo. The price comparison engine looked at its top 50 partner shops in the United Kingdom, France, Germany, Spain, Italy and Poland. 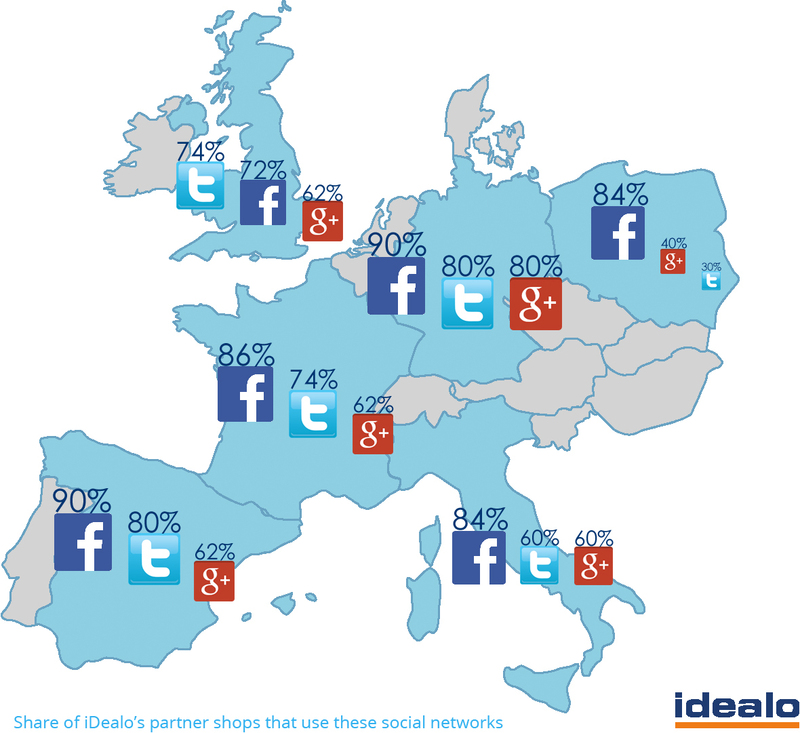 In all the six countries the top 4 social networks amongst online retailers are Facebook, Twitter, Google+ and YouTube. In Germany and Poland blogging is the fourth most popular platform. 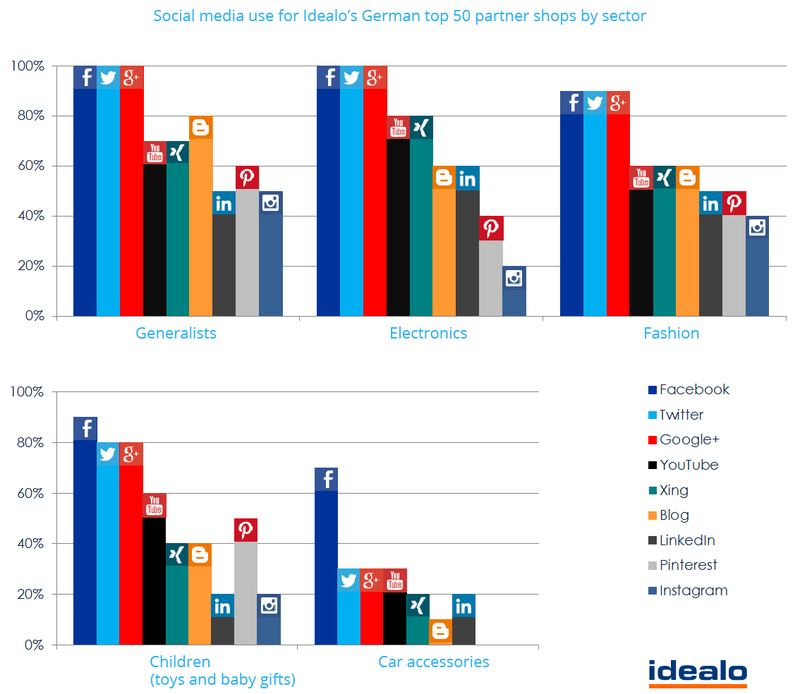 Half of German online retailers relies on weblogs, which are being used for different purposes. “From a consumer-oriented blog filled with inspiration, tips and behind-the-scenes to a B2B blog with information and news for distributors, everything is represented”, Idealo blogs. In other countries Pinterest is more popular than blogging. In Italy this social network is used by almost the same amount of online retailers who host videos on YouTube. According to the German price comparison engine, Pinterest is especially suitable for promoting products, while Instagram is more for documenting personal events. “For retailers, the use of this network is still suitable, for example to provide a look behind the scenes of their companies.” Instagram isn’t very popular in Poland and Spain, while in the UK the photo site is almost as popular as LinkedIn. Idealo also looked at the popularity of the different social networks per industry. Looking at the results by sector, Facebook is by far the most popular social network. It’s used as often as Twitter and Google+ by generalists and the online store owners in the electronics and fashion industries, but in the car industry, Facebook is being way more often used than Twitter and Google+. More about France, Germany, Italy, Poland, Spain or The United Kingdom.